Description of Dog Inflammatory Disease. The definition of Dog Inflammatory Disease is 'inflammare' which comes from the Latin words 'to set on fire'. Canine Inflammatory diseases are caused when the white blood cells trigger inappropriately against the body's own tissues and fight healthy tissues. Inflammation is usually used to fight foreign diseases and is the body's response to injury. There are many types of Canine Inflammatory diseases, the most common can be found detailed below. When you are worried about your pet dogs or puppies it is wise to make general observations and a note of your dog's general well-being before considering a health issue and problem such as Dog Inflammatory Disease. Overall physical condition? Mental attitude? Appetite? Condition of bowels and urinary apparatus? The nose of healthy dogs or puppies is moist and cool but in sick dogs it is usually hot and dry. Hair loss? Dry skin? Discharges? These general observations are useful to consider whilst checking out the symptoms of Dog Inflammatory Disease. - Inflammatory bowel disease. This disease attacks the stomach or intestines and the intestines become chronically infiltrated by inflammatory cells. - Granulomatous Meningoencephalomyelitis (GME), which attacks the central nervous system. Young Female toy dogs are more prone to this disease. - Demodicosis is also referred to as Red mange. Demodectic mange is caused by Demodex canis, a minute size, cigar shaped mite. - Pancreatitis. This disease is more common in middle-aged dogs and is inflammation of the pancreas. - Arthritis is caused by inflammation of joints and can affect the entire body. - Masticatory Muscle Myositis (MMM) is an inflammatory disease in dogs which affects the jaw muscle causing swelling of the jaw and pain when opening the mouth. Canine Inflammatory Disease treatment - Diagnosis and treatment for inflammatory diseases varies depending on the particular disease diagnosed. Canine Inflammatory Disease treatment - It is vital that your dog receives treatment as soon as possible as some inflammatory diseases can cause pain and medication may be required. Canine Inflammatory Disease treatment - Your canine health care professional will fully examine your dog and is likely to perform blood and urine tests. 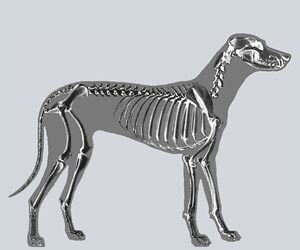 Canine Inflammatory Disease treatment - X-rays and Ultrasound tests may also be required to confirm a diagnosis. Pet Insurance for Dog Inflammatory Disease. Remember canine insurance / pet dogs health insurance for treatment of health and medical problems such as Dog Inflammatory Disease. Unexpected visits to the vet and veterinary treatments for your dogs and puppies due to illnesses such as Dog Inflammatory Disease can quickly add up so get quotes for canine health / pet insurance coverage for treatment due to accidents, treatment of illnesses, prescriptions, surgeries and possible hospitalization treatment for your dogs or puppy. Get the best deals for pet insurance from pet insurance comparison websites - make sure you get the best rates for canine health insurance to cover visits to the Vet for the diagnosis and treatment of unexpected ailments such as Dog Inflammatory Disease. The sole purpose of the Dog Inflammatory Disease section on the Dog Symptoms and Canine Health website is to act as a reference guide to provide useful information to the owners of dogs and puppies. This article on Dog Inflammatory Disease is not intended to be used to diagnose or treat sick dogs or as a substitute for obtaining professional veterinary advice. Please remember that if you are in any doubt about your Dog's Health, or problems associated with Dog Inflammatory Disease, please consult your Canine Veterinary Specialist immediately for professional treatment. Your vet will diagnose whether Dog Inflammatory Disease is the problem and prescribe appropriate medication and treatment.